"Click" on pictures to make them larger. 1. 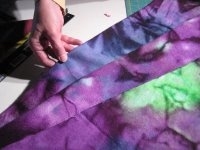 Fold cut edge along salvage to create a triangle. The folded edge is the bias. 2. 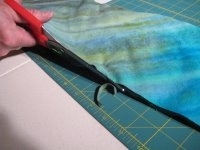 Cut a strip 7 inches wide from fold, then cut fold. Continue cutting 7 inch wide bias strips. 3. 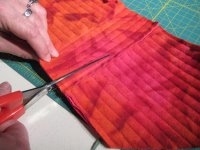 Use longest strip for center, then layer two strips on each side of center making five layers. 4. 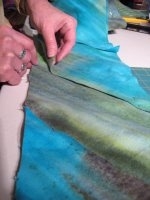 Small pieces can be overlapped to form top two layers. 5. Trim edges and ends. 6. 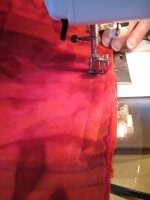 Sew 1/2 inch channels down length of scarf. 7. 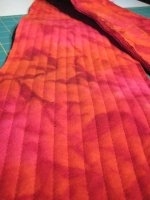 Cut evenly between each row of stitching through top two layers only. 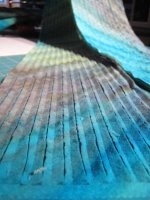 Flip scarf over and repeat cutting process. DO NOT CUT THROUGH MIDDLE LAYER. 8. 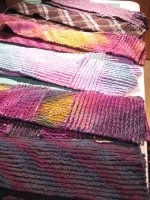 Completed Scarves. Launder in washing machine and dry in dryer to create chenille effect. The final scarves are shown here by our resident model.